Workshop "Surface Treatment and Application of Protection Anticorrosion and Finishes Coatings"
For 5-th year Kammarton Bulgaria Ltd. invites you to a presentation with demonstration dedicated to the new technologies in metalworking, at 03.06. in София, at 09.06. in Novi Pazar, at 10.06. in Gabrovo and at 11.06. in Stara Zagora. The purpose of these seminars is the presentation of news from the world of surface treatment of metals, automation for sandblasting for small and large volumes of work and surface treatment through machines with ultra high and high water pressure. Our guests this year are specialists in the field from company Blast Engineering Ltd. and company Airblast, Netherlands. 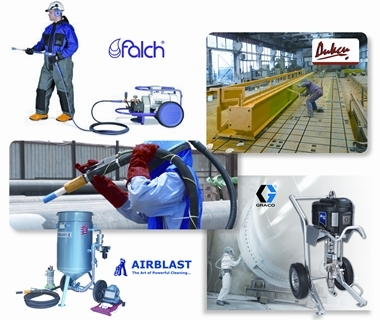 As before, so this year, the company Kammarton Bulgaria will present the novelties in the field of the anticorrosion protection and the finishing coatings of the company GRACO, USA. Guests of the seminar will be the representatives of the manufacturer and the representatives of austrian Ring Holding products - company Dixi LTD.